A fishing ground is Tsugaru-kaikyo. A fishing ground is about 5 km of distance from a fishing port, so the Monkfish whitch lived through us and landed, it’s possible to maintain the state which is just as it is and return to the port. A fishing method is gill net fishery or empty fishing fishing gentle with the environment that a fish catch target was limited. 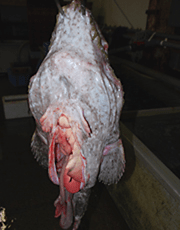 Monkfish is very delicate fish oppositely with the appearance. For a bruise to lead to freshness deterioration, landing work is performed politely slowly. A fisherman and everyone of a fishermen’s cooperative association are making an effort toward high freshness maintenance. Monkfish can be put to sleep more than one night in a fish preserve. An Monkfish just after the landing is becoming impoverished. This is the important process to make the activity energy which becomes a source of a flavor ingredient convalescent. The environment that it doesn’t take a stress for a fish body is maintained. We stick a kitchen knife into bulb and kill in an instant. Monkfish killed in the living good state gives the effect to delay of a freshness decline, restraint of flavor ingredient disappearance and delay of rigidity after death variously. 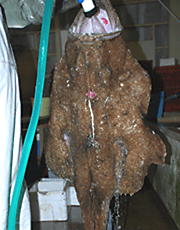 Monkfish killed in the living good state according to the shipment time. For a freshness decline to start more than digestive organ authorities, I’ll remove contents of a stomach and a gut and carry out a lavage immediately. This is the important process and it’s possible to get local cooperation and do. It’s to carry out a lavage in an early stage of a circulation process and is also effective by an aspect of good hygiene. The transportation temperature and transportation time will be an important element on the freshness maintenance. We control the amount of the ice according to the temperature of the shipment day and according to time of the opening. We consider how to put it ice and use of a keeping of freshness seat to the detail. so it’s outstanding in the freshness! We see tightness and freshness by luster of the body, tension of the fin and opening of the pupil. We handle in the hung-cutting in the restaurant. The scene of hung-cutting and seven tools after dismantling. Large body and cheek meat be provided in sashimi will make the aging and dehydration over half a day. Sashimi will be offered within 36 hours from active deadline. It is bland, but is a flavor-rich containing a tightly taste. in the cooking method of inherited tradition. Copyright © 2000-2016 ISE-GEN. All rights reserved.